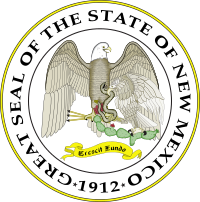 Mars and I have lived in "Ye Most Auncient Towne in Connecticut” for the past forty years, but our plan now is to relocate southwest to Santa Fe, New Mexico, established by Spanish colonists twenty-four years before the birth of Wethersfield – and the self-declared “City Different”. Even those totally unfamiliar with these two locales could probably identify many dissimilarities between them – Connecticut River Valley vs. high desert; English Colonial houses vs. Spanish adobe dwellings; lots of green vs., lots of tan; 59” annual rainfall vs. 14”; etcetera. But they also resemble each other in many ways – at least as seen through the eyes of this amateur gardener and lay horticultural historian. On the other hand just about every New Mexican can recite the Official State Question and Answer – and probably says it at least once a day. A: "Red AND Green” or “Christmas." And every visitor quickly learns exactly what that means – just as we did twenty-five years ago. On our first night in the Land of Enchantment we went for dinner at a local restaurant specializing in New Mexican food. We explained to the waitress that we were new in town, unfamiliar with the food, and (coming from the moderately seasoned New England culinary tradition) pretty much spice-wimps. After guiding us through some entrée selections she posed “the question.” And told us how to answer it. Most New Mexican food (including, as I discovered, Tuna Florentine) is served with chile – which in New Mexico means a sauce made from the pungent pods of either red or green chile peppers, not the concoction of spices, meat or beans known in other places as chili con carne. 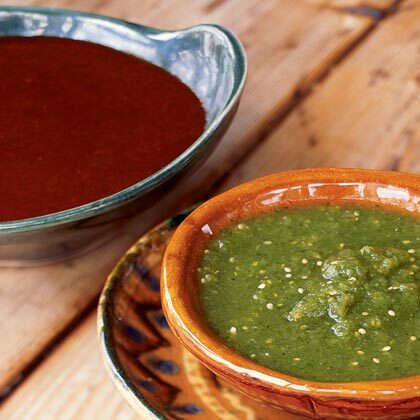 Sometimes the red sauce is hotter – i.e. higher on the Scoville Scale of capsaicin sensitivity. Sometimes it is the green. So THE question with every meal is “red or green”. And the most appropriate answer is “red and green” or simply “Christmas”. Usually the sauce smothers the dish. So, for those of us without asbestos covered taste buds, the waitress said to always ask for it “on the side”. We did that night. And a quarter of a century later we still do. Leaving the sauce dishes 95% full at the end of the meal no longer embarrasses us. Strung together in long “ropes,” (or “skeins”) the onions were shipped all around the world, most importantly to the West Indies where they were used to feed the slaves on the islands’ huge sugar plantations in exchange for sugar, salt, tea, coffee and spices – as well as molasses from which we New Englanders made our own rum. In 1774, its biggest year, Wethersfield exported about one million of these knotted bundles. In the United States, even President Thomas Jefferson grew “Wethersfield Reds” at Monticello. 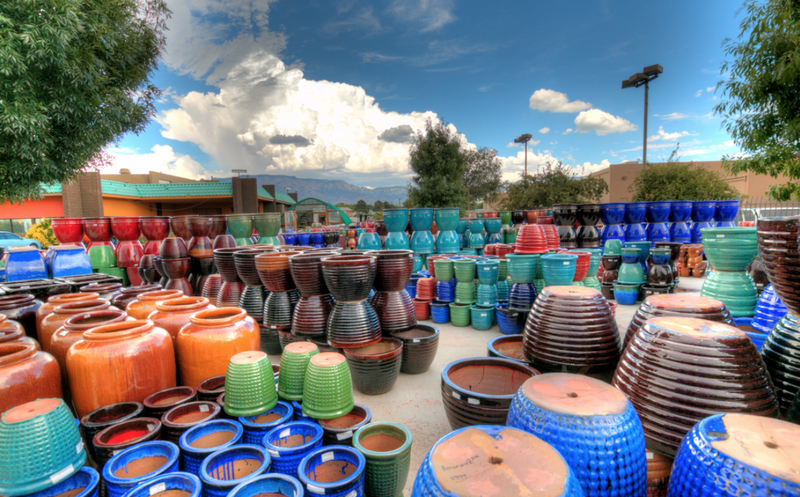 In like manner the chile industry may be the only business in which New Mexico is ranked first nationally. With a direct economic value of more than $57 million in 2009, plus the indirect benefits jobs and tourism, the economic impact of the spicy peppers could be in the hundreds of millions of dollars. 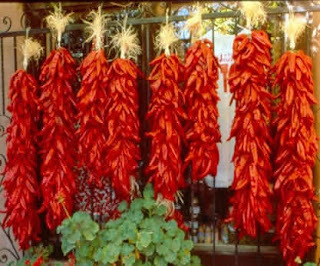 No wonder that strings of drying red chiles – called “ristras” – commonly decorate adobe houses throughout the “Land of Enchantment”. Back here in Wethersfield onions likewise were everywhere. Ropes of red onions, looking like Christmas ornaments, adorned the rafters and doorways of houses and stores. Onions were even used as medicine – as fictionalized in the children’s novel “Witch of Blackbird Pond”, set in Wethersfield. And you could actually pay for just about anything with the famous flat, red onions. In 1764 the town leaders levied taxes to build the First Church of Christ Congregational meetinghouse. Many residents paid their fee in the form of onions, causing the building to be known as “the church that onions built.” To this day our local historical society symbolically pays its annual rent on an 18th-century warehouse not with money, but with Wethersfield Red Onions – and tee shirts, ties and coffee mugs proudly display the beloved burgundy bulb. From whence the Wethersfield Red? The first Pilgrims brought their own onion sets with them from England. And the initial Wethersfield settlers who came down from Watertown, Massachusetts Bay Colony to live and farm likely carried with them some of their own pungent, edible bulbs. Native Indians also harvested wild varieties. 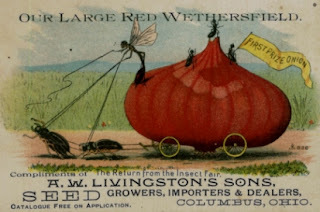 The deep, rich soil along the banks of the Connecticut River was an ideal place for agriculture and the “Wethersfield Red” was developed here by the local onion growers themselves. Producers such as the Wells Brothers began raising them commercially in the 1780s in heavily fertilized beds that were never rotated – the same technique used in the cepinae of ancient Rome. The demise of the plantation system in the West Indies and a Civil War-era blight known as pinkroot brought the reign of the red onion to an end. In New Mexico the end of the chile is a long ways away from being in sight. But even after the decline of the onion trade local seed companies including Comstock Ferre & Co. (still in business here in town under the ownership of the Baker Creek Heritage Seed Company) sold red onion seeds across the country and Europe – but from what I have read not in the desert southwest. The 1856 Comstock catalog said, "It is the kind mostly grown at Wethersfield. It grows to large size, deep red, thick, approaching to round shape, fine-grained, pleasant flavored, and very productive. It ripens in September, and keeps well." 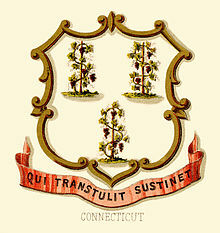 After all, Connecticut’s own State Motto does tell us “Qui transtulit sustinet” – "He who is transplanted still sustains". It is time for Mars, me, and “Wethersfield Red” to test the New Mexican waters (or lack thereof) – to go, and hopefully to grow.